I’ve been arguing that one thing struggling post-industrial cities need to do is take care of their own business, doing things like addressing legacy liabilities and rebuilding of core public services. Last week I write about Buffalo doing just this by completely re-writing its zoning code and creating a new land use map of the city to bring its planning ordinances up to date for the 21st century. Michael Kimmelman, architecture critic at the New York Times, recently wrote a feature on another good example: the replacement of Detroit’s entire street light inventory. Detroit had 88,000 street lights, but only about half of them worked. Many of them were ridiculously old, some dating to the early 20th century I believe. Many of these were historic and charming as a result, but alas they didn’t work and couldn’t be maintained either. What’s more, thieves kept stealing the wire out of them for the copper. Let’s hope that if anyone writes a history of Detroit’s rejuvenation, a chapter is devoted to the lights returning. Like picking up the trash, fixing potholes and responding to emergencies, these efforts signal that no matter where you live in Detroit, you are no longer forgotten — that government here can finally keep its basic promises. This is where the new lights come in. They’re spread all across town. The project cost $185 million, paid by the city and the state. 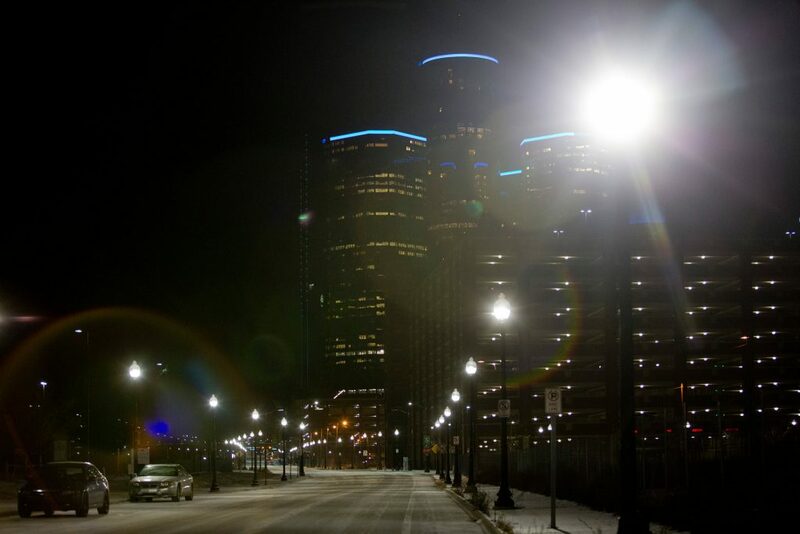 The Public Lighting Authority of Detroit, backed by the mayor, received a critical assist from the Obama administration: Energy Department experts advised local officials to swap out the old, costly, broken-down sodium lamps, which vandals had been stripping bare for copper wire. They recommended LED technology. Investments by the Obama administration in energy-efficient lighting have reduced costs, making LEDs feasible for a city like Detroit. Three years ago, nearly half the 88,000 streetlights in the city were out of commission. The more potent LED lights allow the authority to replace those 88,000 old fixtures with 65,000 new ones, strong enough for you to read one of those glossy magazines after dark. The whole thing came in under budget and on time. When was the last time anyone could say that about a major infrastructure project in Detroit? “An example of how good government should work,” as Lorna L. Thomas, chairwoman of the lighting authority, put it at the switch-flipping ceremony. It’s also an example of how one smart urban-design decision can have ripple effects. Some residents here grumbled about fewer lights. That said, the stronger new ones turn out to save Detroit nearly $3 million in electric bills. They use aluminum wiring, which nobody wants to strip, discouraging crime. The technology even cuts carbon emissions by more than 40,000 tons a year — equivalent to “taking 11,000 cars off of your streets,” [said Shaun Donovan]. Part of creating a willingness to spend more money on government is recreating a sense that government is actually competent. Delivering a project on time, under budget, that will save millions in operating costs, reduce theft, and be more environmentally friendly is a step in the right direction. I’m not the biggest fan of LEDs and might be with the grumblers on wanting a higher density solution. But my preferences for gold level services aren’t always realistic. This appears to be a high quality, cost effective solution the city should feel good about. Other post-industrial cities should take note. Click over to read the rest of the Times piece. Is spreading them across town a good strategy, though? Will Detroit every have the population base to warrant returning full services to the entire low density suburban sprawl, or should it focus on core neighborhoods and encouraging densification where the market demand is there? I don’t have the answer to that question, but it is one that will need to be answered as we address the long term liabilities and unsustainability of much of our low density suburban development pattern. Not just in Detroit. One of the reasons that libraries are frequently among the best of public services is that the public actively uses them. We may rarely or never call on the police or fire department, but the most ardent amongst us may visit the library two or three times a week. You can easily measure the amount of public use and what the public wants. Isn’t it ironic that some of the wealthiest areas in America have no street lights at all.